A natural fortress of virgin rainforest and swamps on the southernmost tip of Java’s west coast, this park is the last refuge from humanity for a myriad variety of wildlife. Ujung Kulon, a name fittingly meaning “Westernmost End” is a step back in time to when the beasts really ruled the island of Java. A menagerie of unusual animals, plants and sights awaits the visitor to Ujung Kulon. Within the park’s 420sq. km there exist agood range of day hikes inland oralong thecoast. Every trail through the park is a crossroads for the vast numbers of animals which call Ujung Kulon home. Large monitor lizards, cousins of the famous Komodo dragons, are abundant. Acanopy of multi-coloured birds like the rare green peafowl and ruddy woodpeckers flit through the green canvas. Mischievous leaf monkeys, rusa deer and the scare blue panther are among the other animals which can be spotted. But the animal which really puts Ujung Kulon on the map is the Javanese Rhinoceros. 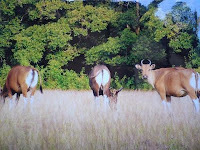 Ujung Kulon was declared a national park by the Dutch colonial government in the 1930s in a last-disch effort to save this lumbering, secretive one-horned herbivore. The rhino had suffered a stunning reversal of fortune in the previous century, its numbers decimated by swelling human populations and the destruction of forest. Today, around 50 or so animals cling onto existence in the park but their furtiveness and well-founded aversion to contact with humans makes sightings rare. The only signs of its presence are its footprints, rhino droppings or branches wrenched off by the trundling rhino. It has not always been easy reaching this National Park, which straddles a peninsula and is only connected to Java by thin marshy isthmus. This inaccessibility has acted as a security blanket against poachers and would-be settlers, but new developments will make the boat trip to Ujung Kulon a more pleasant one.